Heat map illustrates what users do when they are presented with a visual content. A heat map is usually constructed using eye-movement tracking equipment, but in case of a web site, heat map is usually created based on where users click. 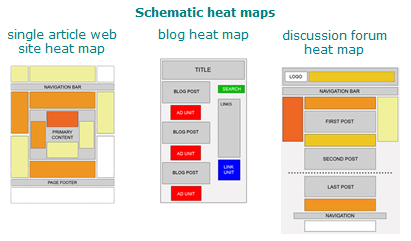 This article explains what heap map is, how heat map is used, and how you can get one for your web site. A heat map is a graphical representation of data points in a two-dimensional area. Each data point has its coordinate X value and its coordinate Y value. The X and Y values determine where a data point is located in a plane. The density of points in a plane is represented on a heat map by colors. Heat map originated in marketing where researchers used so-called pupil tracking equipment (or also eye-movement tracking equipment) to identify and map exactly where people look when they are presented with visual information. Heat map can provide useful information not only in marketing, but in web development as well. Web heat map is used for displaying areas of a web page that are most frequently scanned by visitors' eyes. A heat map can help you improve how much money you make with AdSense (See here for our Make money with AdSense guide for more tips related to this topic.). When do I need heat map? Below you can find a few examples of heat map. 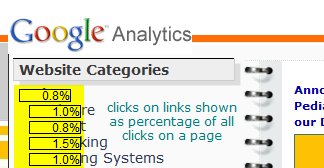 The colored spots demonstrate how many users viewed or clicked sections of the web page. The following is a guide to the colors. You can see that a heat map is not the same for all web sites. Heat map varies by content. Nevertheless, you can also see that heat maps have something in common. Most visitors emphasize the left side of the screen above the fold. Google provides sort of a heat map in their AdSense section (https://www.google.com/adsense/support/bin/answer.py?hl=en&answer=17954). They describe the heat map as an illustration of ideal placements for content and AdSense ad units on a sample page layout. The Google heat map displays sections in colors from white to dark orange (or red) where dark orange (or red) represents strongest performance and white means the weakest performance. You can see that a heat map is not the same for a general-single-article type web site and for a discussion forum and a blog. Each format has its specifics and visitors behave differently. However, all three heat maps provided above have something in common: all three heat maps integrate ads into or place ads as close as possible to the content. 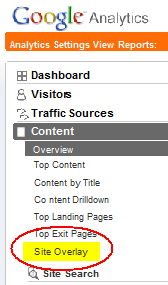 You can find functionality called Site Overlay in your Google Analytics account. Although this functionality is not as nice graphical representation of heat map as shown above, you can still use it for your purpose. It is not quite like the heat map provided earlier on the page, but it can provide a lot of useful information. Pupil tracking equipment is quite expensive, and if you wanted to get a heat map of your web site created the original way, you would have to spend quite a lot of money. The pupil tracking equipment that researchers use to generate heat map has astounding capabilities, but it may be hard to justify the expense. Now, let's see how you use heat map. What do I place into each section of the heat map to maximize my conversion rates? Should I place an ad into the primary zone, or an article that points to an ad? What conversion techniques should I consider for my heat map primary zones? Should I use some "register" functionality, or "download" link, or a click-through ad unit, or anything else? ads placed directly below the end of an article tend to perform very well because users look for more resources after being done reading the article, and targeted ads can provide answers for them. Making changes in the placement of your ads can make a great difference in your conversion rates and your AdSense earnings as well (See AdSense earnings sample from one very successful web site). In addition to heat map, you might be interested in the following articles that also relate to web development and monetization. You are also welcome to check out the resources below, for example our SEO discussion forum.